Custom stairway with a wood inside and outside handrail and custom wood inlay treads. 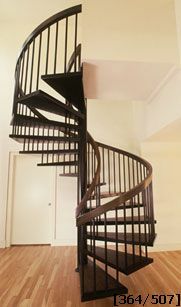 The stair is 76" diameter, 30 degree treads with mounting plate at the top finish floor. The inside and outside handrails are a # 231 (2" x 3 1/2") red oak, balusters are a # 306 (1") round tubing, four per tread, spaced equally on a custom weld plate on the top of the tread, treads are a # 120 (12 gauge) pan type, wood inlay is a 1" thick red oak inverted into the tread flush to the top of the tread. The center column is a 6" ID schedule 40 round pipe. Metal is finished in red oxide primer and the finish paint and wood finish by others at the job site.